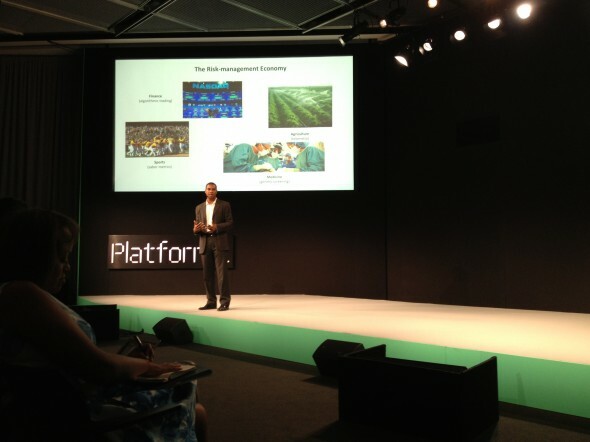 Sheldon Gilbert of Proclivity takes the stage at MIT’s Media Lab at the Platform Summit to talk about risk; mitigating risk, taking risk and profiting from risk. Sheldon’s education in molecular biology, he says, led him down the path as biologists looked at DNA and predicted the likelihood (risk) that someone might develop heart disease or cancer he applied his predictive math skills to ad tech. This entry was posted by John Pasmore on Friday, July 12th, 2013 at 5:03 pm	and is filed under Race. You can follow any responses to this entry through the RSS 2.0 feed.